Home Blog Pet Health Aging Can I Give my Dog Aleve? Aleve (naproxen) is a popular over-the-counter pain medication for people with backaches, toothaches, headaches, menstrual cramps, and even mild arthritis. Dogs also experience some of these problems – especially arthritis – but that doesn’t mean you can run to the store and give your dog the same pills you take for daily aches and pains. Aleve is extremely toxic for dogs. Sadly, many well-meaning pet owners wrongly assume that Aleve is safe for dogs. The fact is that just one pill of Aleve can be deadly for a lot of dogs. The side effects of Aleve include bleeding in the stomach, kidney failure, and death. The bottom line is this: Never give human medications to your dog unless instructed to do so by your veterinarian, and keep all medications in your home secured to help prevent accidents. Fortunately, there are dog-specific painkillers such as Metacam, Deramaxx, and Previcox. So there’s no reason to ever give your dog Aleve®. Veterinarians will sometimes recommend low doses of other painkillers, such as aspirin. But even aspirin can cause severe side effects in dogs if given at the wrong dose, so you should still talk to a veterinarian first to determine the best treatment. Aleve® is a brand-name for naproxen. It is one of the most common pain medications in the world. Naproxen belongs to a class of medications called Non-Steroidal Anti-Inflammatory Drugs (NSAIDs). It is also sold under the brand-names Naprosyn, Anaprox, and Naprelan. These drugs all work the same way. They are used to relieve pain, fever, swelling, stiffness, and joint pain associated with arthritis. Aleve is not a safe method for pain relief in dogs because it has a high risk of side effects in the stomach and kidneys. Veterinarians do not generally recommend Aleve because there are several FDA-approved painkillers for dogs that have a much lower risk of side effects. Aleve is only used in dogs as a last resort after safer alternatives have failed to provide pain relief. While there is technically a very low dose of Aleve that will probably not cause side effects, the difference between a “safe” dose and an overdose is very small. You should never give a dog Aleve unless you are specifically told to do so by a veterinarian. You should also try to prevent accidental overdoses by storing Aleve where your dog can’t get into the bottle. If you take Aleve to manage your own pain, be sure that you do not accidentally drop a pill while your dog is underfoot. There have been cases where dogs died because they snatched up a pill off the floor. It can happen in an instant. How much Aleve is poisonous to dogs? Aleve tablets usually contain about 220-mg of naproxen – enough to poison dogs small and large. If your dog does swallow Aleve, it is absorbed into the bloodstream very quickly – usually within 30 minutes to 3 hours – so you must act fast. A single dose of Aleve (as low as 2-mg/lb) can cause side effects, but higher doses can cause rapid kidney failure. Depending on the size of the dog and how much Aleve was consumed, side effects usually appear within 2 to 24 hours. In some cases, kidney failure can occur within 24 hours. The risk of side effects increases for older dogs – especially those with existing kidney problems. What should I do if my dog ate Aleve? Take your dog to a veterinarian immediately if you believe he ate a pill of Aleve. If it happened recently, your veterinarian might ask you to try to get your dog to vomit up the pill with hydrogen peroxide. The dose will depend on the size of the dog. Even if your dog vomits up the pill, it is still a good idea to go to a veterinarian as soon as possible. Some of the pill might have been absorbed already. If you go to the veterinarian quickly enough, however, your dog will likely get a dose of activated charcoal. This will absorb any Aleve still remaining in the stomach. Activated charcoal only works if it physically comes into contact with Aleve in the stomach or intestines. It binds to the toxins and prevents the body from absorbing any more of the poison. Unfortunately, it is only effective if it is given within a couple hours. After a few hours, treating your dog will be much more difficult. Can I give my dog any other painkillers? NSAID painkillers work by blocking the effects of the enzymes in the body that cause pain and inflammation. Dogs normally shouldn’t take Aleve for pain, but veterinarians sometimes recommend other types of NSAID painkillers for dogs with pain. These medications, however, should only be given to dogs if they are specifically prescribed by a veterinarian. The NSAIDs listed above are specifically created for dogs. They also work very differently from Aleve. The problem with Aleve is that it blocks some enzymes it doesn’t need to, and therefore causes more side effects. Modern NSAIDs like Deramaxx, Previcox, and Metacam are better at blocking a specific enzyme called COX-2 that causes inflammation, which is why they are safer for dogs than Aleve. What is the problem with Aleve? Aleve reduces pain and inflammation in the body by blocking an enzyme called cyclooxygenase (COX). The problem is that COX produces prostaglandins, which are hormones that protect the gastrointestinal system and help with kidney function. Aleve and other prostaglandin-blocking medications can cause bleeding and ulceration of the gastrointestinal tract, as well as kidney failure. What are the risks of giving Aleve to a dog? Aleve is toxic to dogs, plain and simple. Even in humans, Aleve commonly causes stomach ulcers. Dogs are even more sensitive to the stomach and intestinal system side effects of Aleve. In dogs, Aleve is likely to cause stomach ulcers, gastrointestinal bleeding, and kidney problems. It can also be fatal. Can my dog get stomach problems from Aleve? Yes. The stomach and intestines normally have a mucous lining that protects them against being damaged by acids in the stomach. Aleve damages this protective lining, so acids and digestive juices attack the stomach directly. The result is an open sore or a raw spot called an ulcer. Severe stomach ulcers can cause bleeding or even breach the stomach. This is called a gastrointestinal perforation and it is a life-threatening condition that requires emergency surgery. If treatment is delayed, bacteria from the stomach can enter the bloodstream and cause sepsis (blood poisoning) or a whole-body reaction called shock. Can my dog suffer from kidney failure from taking Aleve? Yes. Aleve blocks the production of hormones called prostaglandins that control blood-flow and filtration in the kidneys. Dogs who are poisoned by Aleve will likely develop kidney dysfunction and even failure. The kidneys, however, are very resilient – even in dogs. Kidney dysfunction is often reversible in dogs. If kidney failure does occur, a veterinarian will need to monitor the dog’s blood and urine levels for a few days. The dog will also need IV treatment to help the kidneys recover. However, high doses of Aleve sometimes cause permanent, irreversible kidney failure. What are the symptoms of Aleve poisoning in dogs? The symptoms of a dog who was poisoned by Aleve include vomiting, bloody diarrhea, weakness, lethargy, internal bleeding, stomach ulcers, anemia (not enough oxygen or red blood cells in the blood), irregular heartbeat, depression, and black or dark-colored feces. The dog may exhibit additional severe symptoms if there are other complications presents, like stomach perforation, kidney inflammation, or liver damage. The symptoms of Aleve toxicity can increase over a 72-hour period, so your dog will need to stay at a veterinary hospital for a few nights for monitoring. Dogs who suffered a severe overdose will likely need to stay at the veterinarian for at least 3 or 4 days, or until their health returns to normal. What treatment will my dog need if he was poisoned by Aleve? If you accidentally gave your dog Aleve or you believe your dog ate Aleve, you need to get to a veterinarian immediately. Your dog will have a better chance of surviving if he receives treatment immediately. Treatment may include a blood transfusion in cases where a dog has lost a lot of blood from internal bleeding. A blood transfusion can also help eliminate Aleve from the dog’s body as soon as possible. Veterinarians may also provide supportive treatment, including intravenous (IV) fluid drip with electrolytes, potassium, B-vitamins, and antacids. Supplements may be a good option for dogs with pain due to arthritis or achy joints. Glucosamine, in particular, is common for dogs with joint pain. While it is not a painkiller, it can help repair of damaged cartilage in the joints and help relieve pain by improving mobility over time. Joint supplements are available at many of the same stores where you can buy NSAIDS (grocery, pharmacy, etc.) but you should always talk to a vet before giving your dog any type of supplement or medicine. If you do purchase supplements, make sure they are dog-specific supplements recommended by your vet. While supplements can help, there are a few risks associated with them. Supplements can interact negatively with other medications your dog is taking. Also, not all brands are made the same way from the same source, so quality can be difficult to ascertain. Some dogs also may have underlying health conditions that predispose them to developing side effects from supplements. Always talk to a veterinarian before you give your dog supplements, especially if the dog has kidney or liver problems. Like with Aleve, they could be poisoned if they can’t eliminate the supplement from their body. Watching your dog experience pain is a difficult thing for any dog owner. But if your dog is suffering from severe or chronic pain, ask your veterinarian if there is anything that can be done to make them more comfortable – don’t take it upon yourself to fix. Your vet might recommend a combination of a dog-specific NSAID and a more powerful painkiller such as Tramadol, Gabapentin, or Amantadine. The vet may also recommend a combination of multiple NSAIDs, although this may increase the risk of gastrointestinal ulcers. 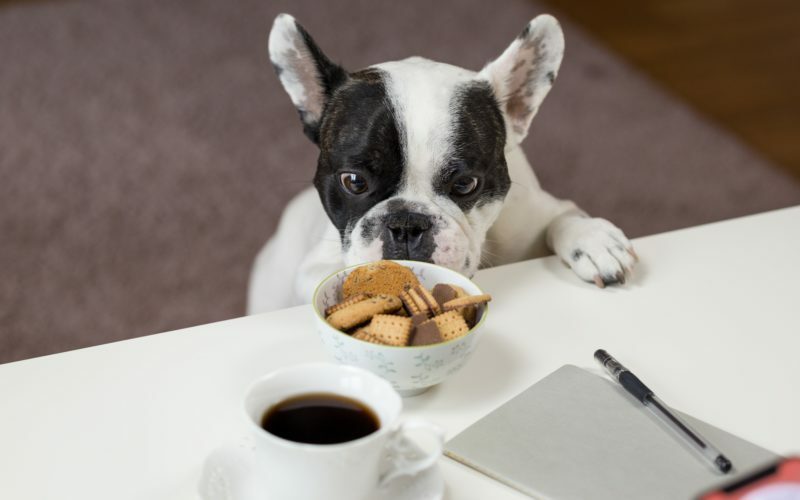 If the dog is at risk of developing gastrointestinal side effects, he may also need to take an antacid to reduce the amount of stomach acid and prevent ulcers. Again, your vet will know best what to give the dog based on his past medical history, size and other factors. What else can I do for my dog when he is in pain? The first thing you should do is make sure your dog is as comfortable as can be. If your dog has a bed or crate they enjoy, add an extra pillow or blanket to cushion it more. You can also bring the food and water bowls close to the bed so your dog does not need to leave his comfort nest. If your dog has trouble getting around — perhaps because he has arthritis, osteoporosis, sore knees, hip problems, or is recovering from surgery — lift and carry your dog (if possible) up and down the stairs, and outside to use the bathroom. Rugs can also help your dog avoid slipping on non-carpeted floors. Holistic remedies, like diet and exercise should be increased, when your dog is up to it. Good health is essential to repairing damaged tissues and resisting degenerative illnesses like arthritis. 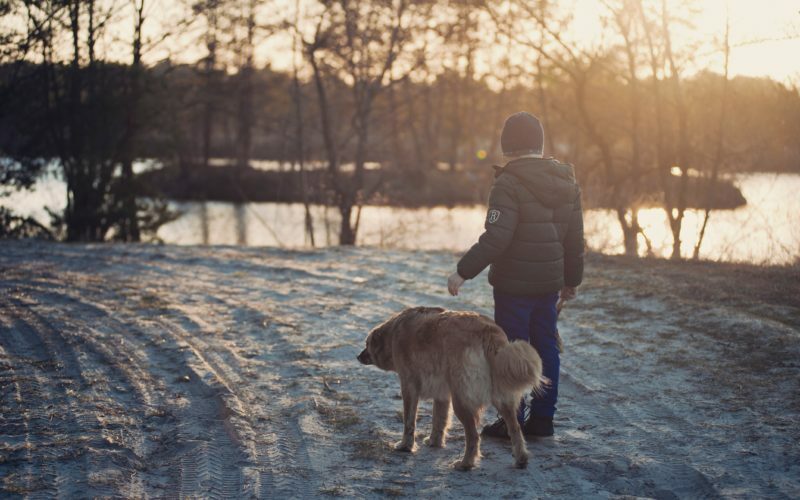 Keep your dog at a healthy weight to reduce wear-and-tear on the joints, and be sure to take your dog on walks so long as exercise does not make the pain worse. Clark, Mike. “Can I Give My Dog Aleve? Is Aleve Safe For Dogs?” Dogtime, 16 Aug. 2018, Accessed 8 Oct. 2017. www.dogtime.com/dog-health/67287-can-i-give-my-dog-aleve-safe-for-dogs. Smith, Nat. “Can I Give My Dog Aleve?” Rover, 29 May 2018, Accessed 8 Oct. 2017. www.rover.com/blog/can-i-give-my-dog-aleve/. “What Can I Give My Dog For Pain Relief?” PetMD, Accessed 8 Oct. 2017. www.petmd.com/dog/centers/nutrition/evr_dg_pain-medication-for-dogs. “Is Aleve Safe for Dogs?” Smart Dog Owners, 23 Mar. 2017, Accessed 8 Oct. 2017. www.smartdogowners.com/aleve/. Clark, Mike. “Can I Give My Dog Aspirin? Is Aspirin Safe For Dogs?” Dogtime, 20 Aug. 2018, Accessed 8 Oct. 2017. www.dogtime.com/dog-health/67343-can-i-give-my-dog-aspirin-safe-for-dogs.